The new “Display on Zillow Group” field is now required when adding or editing listings. If your Zillow field already displays “No”, it means your Managing Broker has set that preference for your office. Check with your Managing Broker if you have questions. If your Zillow field is already displays “Yes”, your Managing Broker has opted in but you can change it to “No” if you do not want your listing sent. If your Zillow field has no default (as shown), your Managing Broker has not made a choice for the office. 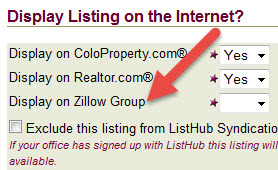 You can choose to send your listing to Zillow Group or not by completing this field. This applies to newly entered and existing listings. Important to note: If you send your listing to Zillow and change your mind later, the listing information will not be removed from Zillow or Trulia. However, the status will be changed to “Off Market”. Zillow Group includes Zillow & Trulia and they will begin using our feed on Monday, April 6th. For more information, view the complete Syndication FAQ’s. If you are a Managing Broker and would like to set your Office Preference, view the instructional video. Download new listing input forms. You may need to log out & back in to see the field. If you have questions, give us a call!